What would it take to make London the digital capital of the world? 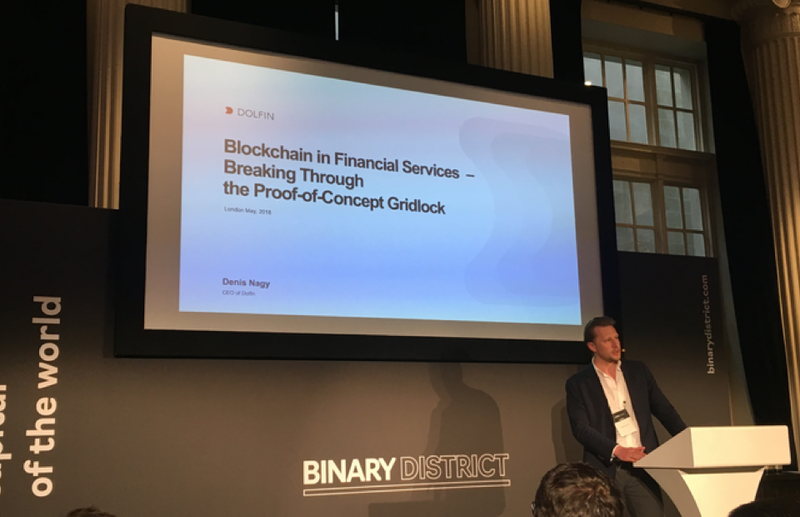 Dolfin CEO Denis Nagy joined the line-up of speakers at Binary District’s most recent London event to consider whether blockchain is the answer. Over coffee at Binary District’s Genesis London conference in February 2018, an intriguing question was posed: Could we solve Brexit using blockchain? Three months later, on 31 May, the collaborative technology community came together to attempt to answer it – or, more specifically, to discuss whether, by embracing blockchain technology, London can reinvent itself as the global digital capital it will need to become after Britain leaves the EU. Bryant went on to outline the key issues the impressive line-up of speakers would be addressing: how London can benefit from emerging developments in open banking and blockchain; whether GDPR should be viewed as a challenge or an opportunity and how new GDPR-compliant approaches to data can be developed; and whether centralisation of knowledge, data and wealth is a thing of the past and, if so, what this means for cities. The first speaker was Dave Michels, Technology Law Researcher at Queen Mary University of London, who began by confounding delegates with a trick question: “Who here owns cryptocurrency?” Case law, he explained, shows that this is a grey area – a legal puzzle alongside that of whether blockchain is, or can be made to be, GDPR-compliant. Next to speak was Dolfin CEO Denis Nagy, who put forward our perspective as a provider of custody, asset management and brokerage services on the impact of blockchain on trade finance. Nagy believes that blockchain in financial services has now moved past the stage of early adoption to enter a growth phase, which will see new providers and models emerging as deployments go viral across asset classes and incumbent processes and services are discarded. By 2025, he told delegates, adoption is likely to be considered mainstream and integral to the capital markets ecosystem. Julian Wilson, Head of Mobile Innovation at Barclays, also approached the issues from a financial services standpoint. One of the biggest names in blockchain technology, Waves platform CEO Sasha Ivanov, offered a glimpse into the future when he introduced Vostok, a private platform currently in the process of launching, which will combine open and closed blockchain systems to offer ready-made solutions for large businesses and government. The private blockchain platform and system integrator will have applications as wide-ranging as electronic voting, supply-chain traceability, identity management, corporate registry systems, real estate transactions and government tenders, Ivanov said. The evening concluded with a panel discussion in which the question was posed: “What are London’s prospects post-Brexit?” After the exciting and groundbreaking ideas the panellists has presented, Binary District’s Editor in Chief and Head of Insight, Margarita Khartanovich, ended on an optimistic note.